Embodying DIY culture and a heavy sense of Lynchian-like fantasy, London-based tattooist Clare Frances boldly experiments with typography and imagery embedded with romance and rebellion. Although every-moving, her rough designs and hyper-clean work continues to explore a world of darkness and digital-despair unseen to many. 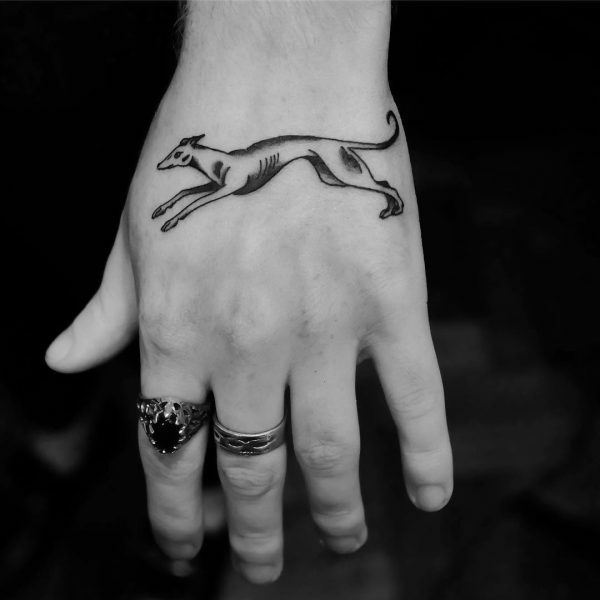 Here, Clare Frances speaks to her dream-like inclinations, the ways in-which tattoos exist between the external and the internal and how marking yourself is a way of creating your own reality. Hi Clare, can you speak to your relationship with tattooing? My first memories of tattooing are of my Mum and her husband getting tattooed. She got an 80’s-style rose on her chest and he got a spikey tribal piece, naturally. To be honest, I didn’t think much of it at the time, but looking back I was surrounded by people pushing their body’s boundaries. We spent a couple of summers in Cuba when I was a kid, and some of my strongest memories of those trips were extreme examples of this. I met a kid with all gold teeth, and got my photo taken with this man who was trying for the world record for most facial piercings. Self-expression was flowing around me, so when my time came, it just made sense. Your work reflects London, in-that it can be both cold and rough, but there’s more-so a sense of un-reality to it – a sense of fantasy or in-between-ness. What is it you are trying to capture and achieve with tattooing? Part of tattooing is being able to create your own reality. Modern living is fantasy. The line between fantasy and reality is becoming increasingly blurred, and the feeling it leaves is dream-like. I grew up in London, and as a teenager I always liked hanging around Soho at night – all dark and cold, but with an excited sense that anything could happen. In contrast to my day-to-day life attending a Catholic school, those nights felt dream-like too. I want to make tattoos that reflect that feeling, and at the same time, I don’t think it’s something that should be taken too seriously. I think in a way tattooing embodies two extremes. It’s such a serious, permanent mark for life, and at the same time it’s just some ink in the skin. Tattoos physically exist in the in-between – between the external and the internal. You can hardly even touch a tattoo. London reflects that too; it has so many extremes and contrasting realities. Working with Liam Sparkes at Old Habits has taught me the importance of going with your gut on both sides of the tattoo process, and being able to have fun with it. The energy at the shop has the right balance of business and pleasure – there’s a feeling that something exciting is happening here! Typography seems to be an important element of your work, what with you creating custom fonts from client-to-client. Can you speak to this relationship with typeface, and how it developed? I think my relationship with typography stems from making zines and putting together sketchbooks as a teenager. When it came to bands or zines or posters, it was all about the typeface. Words are powerful things, and people always want to get them tattooed. They can represent anything. Of course, this idea of fantasy plays into it too – how the meaning of a word can be transformed by the style and placement of the script. I have lots of ideas for script tattoos going forward, but I also don’t want to overdo it. I don’t want it to become something of a fad. I think it’s more important to keep evolving and avoid getting too stuck on one thing, but I will always enjoy playing with type. Tattooing is becoming more and more inclusive, with all-accepting studios giving queer tattooists a space and a voice. How have you seen the politics of tattooing change and evolve first-hand since you started-out? 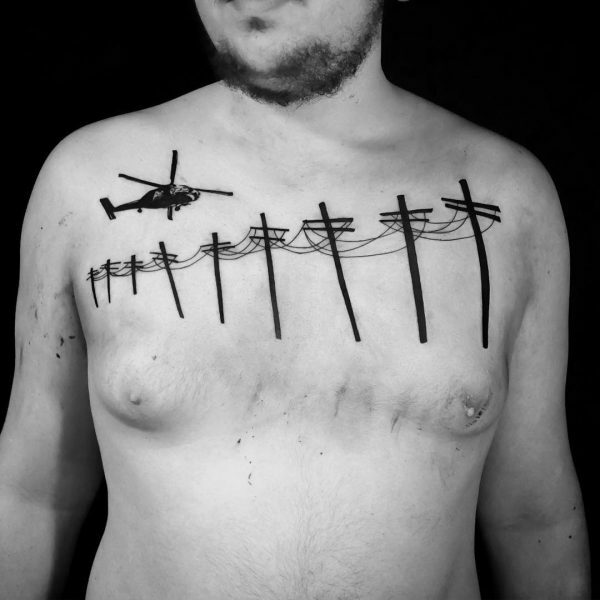 For me, the politics of tattooing is a reflection of politics on a larger scale. Technology is the big thing that’s changing us on all sides, and as we transition into these new ways of doing things, some of the old ways get left behind. Ways of thinking change as well, and power shifts hands. As far as the politics itself, I think there’s more to it than just paying lip-service on the internet, and a lot of “progress” is just marketing. I have no interest in that. The tattoo “scene” has no governing body, and that makes it difficult for big changes to occur across the board. I think it’s more about finding your place within it and making it what you want. If fundamental change is possible, I think it comes from educating ourselves and making real efforts towards something better. Parallel to tattooing, you push self-made zines – xeroxing newsprint, paintings, tattoo-stencils and drawings to create raw and powerful publications. When did you start creating in this way, and what was the catalyst for your DIY-ethos? I was raised by a strong single Mother who did everything by herself, so this ethos was something I grew up with, in a sense. I discovered punk and riot grrl, and it gave this itch I have to make things some focus. I bought as many zines as I could, and like most teenagers I loved music and all the visual aspects of it all. I typed everything out on my typewriter, and spent most of my money on photography materials and photocopy card. However, things started getting good a few years back when I bought myself a Xerox machine. It’s so immediate and raw. There’s this balance between the digital and the physical that it holds and produces that’s just perfect to me. As well as drawing influence from both traditional and prison-style tattooing, your work has strong ties to fine-art. Do you have a background in visual studies, or was this relationship born of self-initiated interest? I think, like most people my age, it’s the visual aspects of culture that we can’t get enough of. I love fine-art, but I also love pop culture and trash. Las Vegas is my favourite place in the world! The degradation of culture is what I’m interested in. Yes, going to the Eiffel Tower in Paris is beautiful, but so is the Eiffel Tower outside of the Paris Hotel in Las Vegas. I did this Martin Ramirez sleeve, and I directly took the work from the artist. That’s something I occasionally do – often as a comment on the value of art and images, and how application or situation can change said value or meaning. For the Ramirez sleeve thought, it was more that it his work is visually strong and perfect for tattoos; the repetition, contrast and subject matter translate brilliantly, and I was so happy with how it came out! You can find more from Clare Frances on Instagram. Clare Frances is currently a resident artist at Old Habits Tattoo.